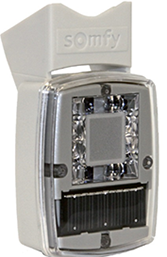 Strong winds can damage a motorized awning, so protect your investment with this motion sensor. This battery operated unit mounts to the arm. It senses any excessive shaking of the awning due to wind, and retracts the awning automatically. 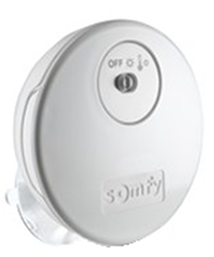 The Ondeis WireFree™ RTS is a solar powered combination rain and sun sensor compatible with Radio Technology Somfy® motorized exterior products, including awnings, rolling shutters and screens. 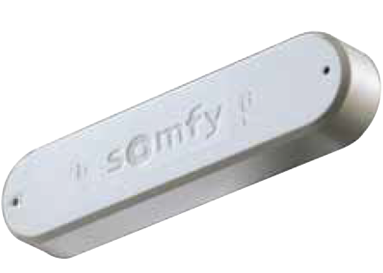 The Sensor monitors rain and sun levels and automatically activates RTS motorized products once user selected thresholds are passed. *Note: Above wind, rain, and sun sensor devises are recommended optional accessories you can purchase with your awning or shade. Theses devises are not guaranteed to keep the product safe and are not subsititute for good judgement. They are devises that can minimize damage to the product. It is best to monitor an extended awning at all times. Sunair® awnings do not warranty our products from damage when using these devices ( see separate Sunair® warranty).